We have a great new event coming up on March 15, 2019! It's called "Salsa y Mas". There will be salsa (the food), salsa dancing, and more. We love handing out dictionaries! Our biggest day of the year at Vallejo Rotary is the day we hand a dictionary to each and every 3rd Grader in Vallejo. Thursday, November 16th was the day this year. On this day, Vallejo Rotarians took time off from work and their busy schedules to visit each of the schools in Vallejo and personally hand a dictionary to each 3rd Grader. These dictionaries are theirs to keep. They get to write their names in them and everything. Dictionaries may seem out-dated in this day and age of the internet, but they are part of the teaching curriculum in 3rd grade in California. Many families do not have the resources to buy a dictionary for their 3rd Grader to keep at home. So it is with great pride that we provide them with this essential tool for literacy. 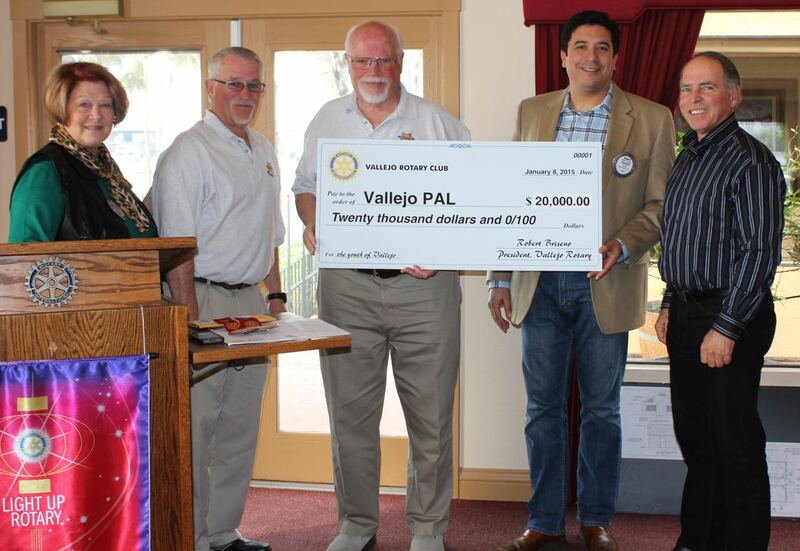 (from left to right: Connie Howard (Vallejo Rotary Club Secretary), Jim Lyon (PAL Board President), Mike Kollar (PAL Executive Director), Robert Briseño (Vallejo Rotary President), Ron Richardson (PAL Commissioner of Youth Sports). On Thursday, January 9th, 2015, the Vallejo Rotary Club donated $20,000 to the Police Athletic League. This money is earmarked to pay for real restrooms and concessions facilities at the PAL field. Ron Richardson (PAL Commissioner of Youth Sports, and project manager for this improvement), Mike Kollar (PAL Executive Director), and Jim Lyon (PAL Board President) were on hand to explain where the new restrooms and concessions facilities would go and at what stage the project currently is. The PAL field is at the corner of Star and Wallace right next to Franklin Middle School. Ron hopes to have the restroom/concession facilities part of the project finished by May of this year. We just donated $1,000 to Leadership Vallejo! It's great to be a part of such a great organization. Any member in good standing wishing to propose a new member should read the information regarding the process by following this link. 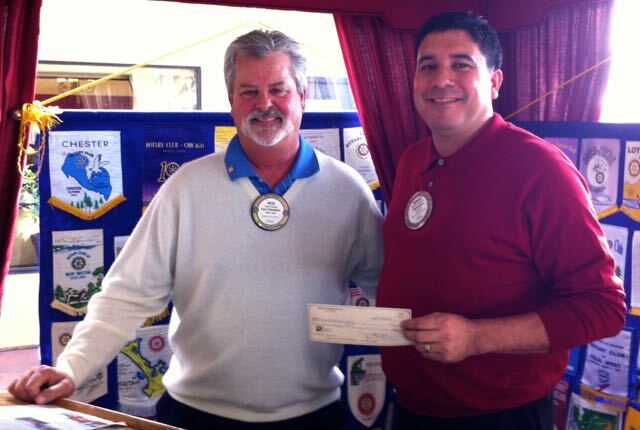 Please visit the community service area to view information about the Vallejo Rotary Club Education programs here. If you think you might be interested in becoming a Rotarian consider our four way test and if you feel it applies to the way you do business then click here and learn more about our organization.